According to CoinFire, Cryptsy is currently under investigations by various US enforcement agencies. This will be very interesting news to follow in the coming weeks/months but do also be on alert with regards to your funds there should more negative news follow through. 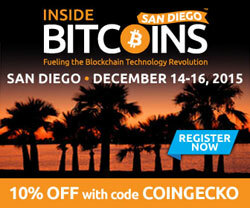 Inside Bitcoins hits San Diego on December 14-16, 2015! Experience a half day of tutorials plus two days of sessions led by industry experts and exhibition hall access. Attendees can also check out the Startup Competition and Networking Dinner. Use code ‘COINGECKO’ for 10% OFF. Learn More. Coin Fire is now able to report that multiple federal investigations are underway regarding Crypsty including the Securities and Exchange Commission, the Internal Revenue Service, and the Criminal Investigation Division of the Internal Revenue Service, among others. Gemini, the bitcoin exchanged started by Cameron and Tyler Winklevoss, has finally received approval to launch from the New York State Department of Financial. Ripple is releasing Interledger, a new protocol aimed at connecting bank and blockchain ledgers. Luis Buenaventura, previously from Rebit.ph shares his thoughts and insights in Bitcoin remittance after he left the company. Tim Swanson, Director of Market Research at R3 shares some insights on R3's plans in the coming months with the banking collaborations in place. CoinDesk speaks to developers seeking to update the functionality of bitcoin's technology to allow for cost-effective micropayments. The Stellar network upgrade is coming soon! The upgrade to the Stellar network has been nine months in development and will be ready soon. The big news is that the old native currency, stellars will be "upgraded" to the new native currency, lumens. One way to think of the blockchain is as a journal or diary shared by people all over the world. The journal starts out empty, but then someone can write the first entry on the first page, and once that happens, it will be synchronized to every other person’s copy of the journal so that they are all kept up to date. 21 Inc. prepared a very good Bitcoin tutorial for all to learn. Antony Lewis explores digital tokens in relation to cryptocurrencies and blockchains, differentiating between blockchain-native tokens like BTC and asset-backed tokens like IOUs on Ripple. Enjoyed this newsletter? Forward this to a friend!